With the Long Beach Expo less than two weeks away dealers are already visiting California for a quick start on wholesale business at surrounding coin shops. There are also two major auctions just prior to the show beginning with Superior Galleries the morning of May 27th and then the Ira and Larry Goldberg Auction in the late afternoon. The official show auction is hosted by Heritage Galleries beginning on May 31st. There will be plenty of rare material for the advanced collector. There are an enormous number of advances as depicted in this week’s Wholesale Dealer Price Guide for Seated Liberty Half Dollars. This area has been overlooked by collectors for a long time but has quietly taken on a life of its own. Specialists in this series have known that these coins have been under priced because of the reported high mintages. However, a look at the census reports indicates very few have been certified. Attrition has plagued seated coinage and most coins have problems; we do not consider them for reporting values. 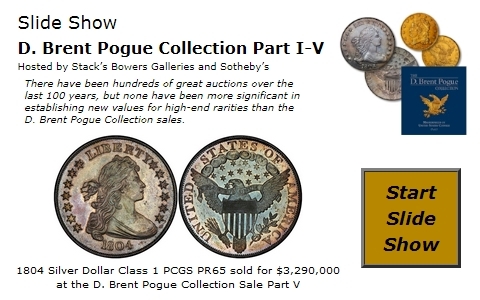 Problem coins are not certified by NGC or PCGS, thus accounting for the low census numbers. Deep Mirror Prooflike Morgan Dollars are hot as several dealers try to find many of the toughest dates in the highest grades certified. With just a couple coins certified in these ultimate grades it is no wonder that potential sellers will want big money to part with them. It takes a very serious collector to try to complete a collection in this series.